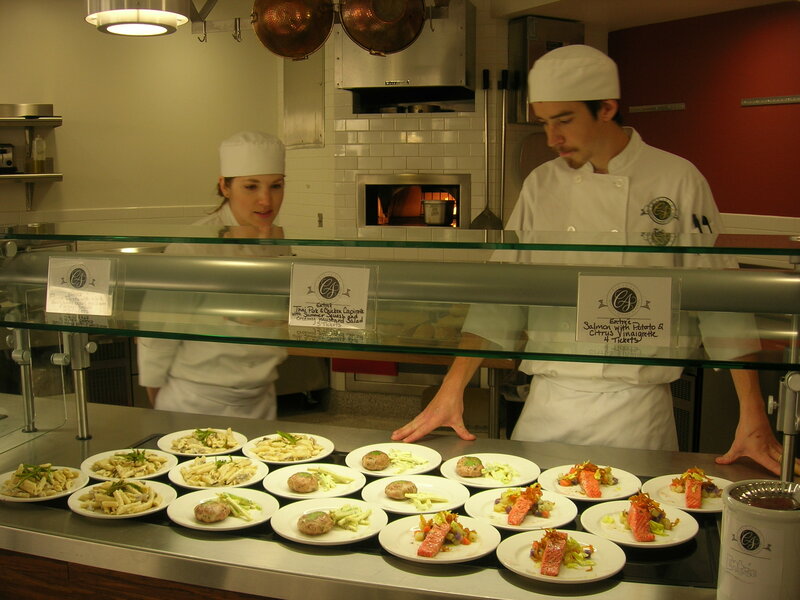 Did you know?– the students in the Seattle Culinary Academy want to serve you lunch! The SCA, part of Seattle Central Community College on Capitol Hill, has three (three!) 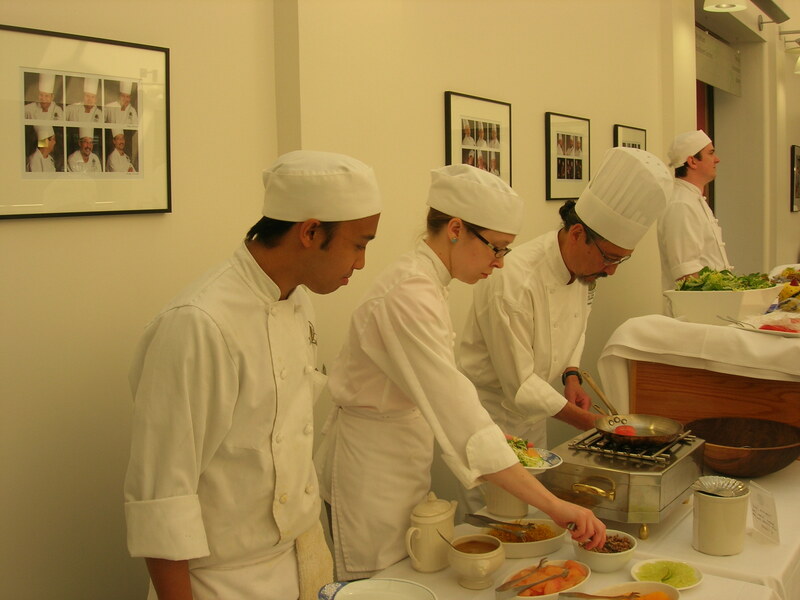 different restaurants staffed by chefs-in-training who prepare the food and serve it to you in style. On top of that, in the summer they offer a special small-plates menu, which I sampled a couple of weeks ago. It was a big moment for me!–Earlier this summer I had watched these very same students learn to grow the ingredients I was eating. And therein lies a story. 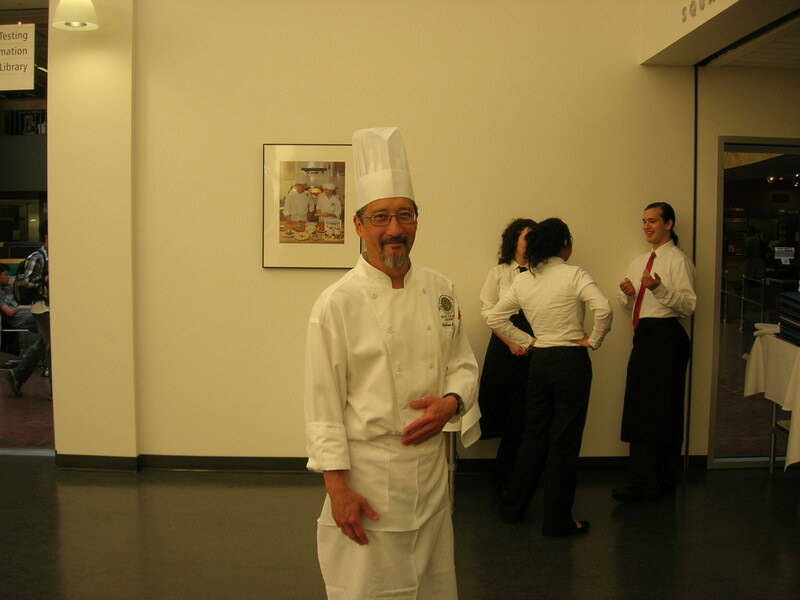 My connection to the SCA actually goes back several years, when my friend Donna and I took a series of evening cooking classes in the professional kitchen there. (Donna was good; I was . . . learning.) What a series!–stocks, soups, sauces, poaching, steaming, grilling, roasting, braising (who knew about braising? 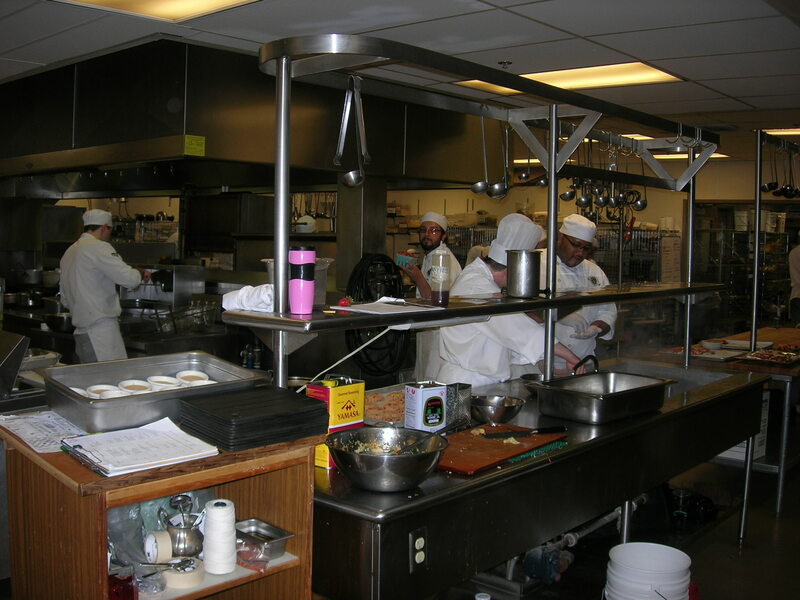 ), eggs, poultry, pasta, grains, veggies, seafood, dairy–chef Hope Sandler marched us through weeks of hands-on cooking, with (miraculously) no casualties, other than one or two minor cases of blood-letting and mutual burning. You’d think after that I’d never need another cooking class in my life! 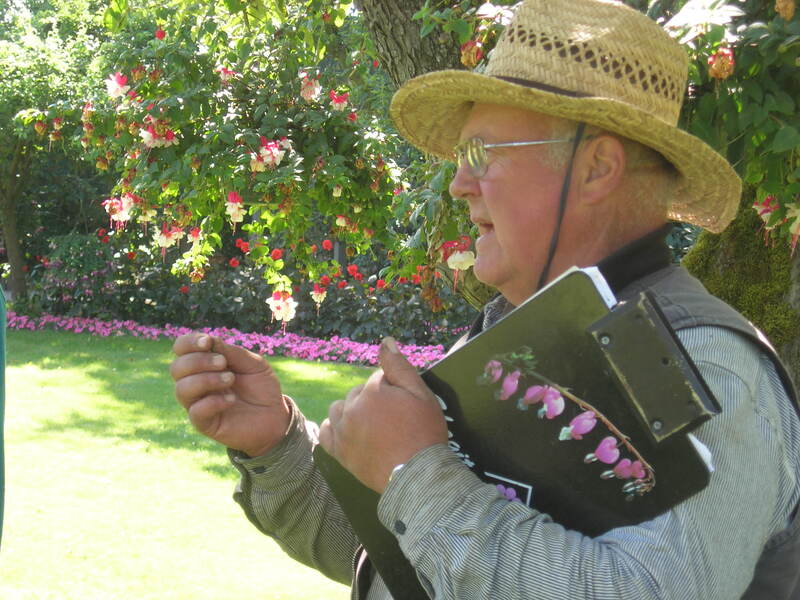 But I keep signing up, and one of the best I’ve ever taken was a two-day class offered by chef Sally McArthur at La Conner Flats, an 11-acre English country display garden and working far m north of Seattle in the Skagit Valley. 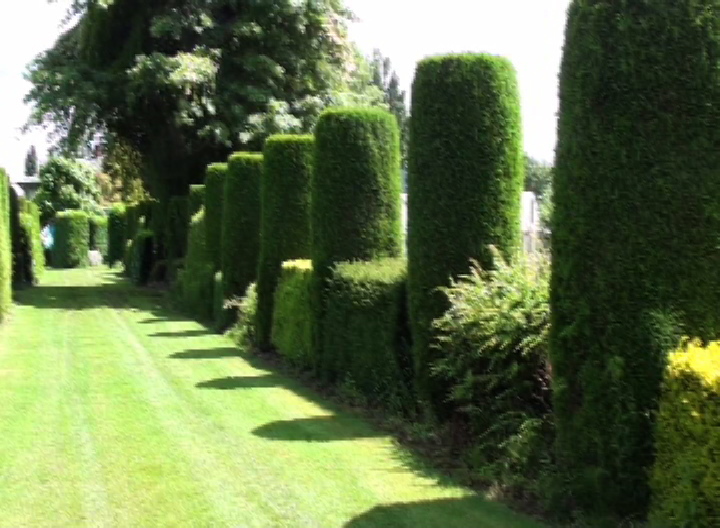 After a full day of cooking in the farm’s Granary, we ate our dinner alfresco at a long table on the lawn, then played boules in the garden’s beautiful allée. But Sally gave us more than a cooking (and bowling) class; she also painted us a picture of the lush fertility of the Valley (which is on the same latitude as France’s Loire Valley) and of the careful stewardship that sustains it. Besides getting acquainted with garden owners Bob and Margie Hart, we harvested tomatoes for our meal at the Hedlin Family Farm nearby, and tasted Pasek Cellars berry wines in the garden’s gazebo. We munched on cheese from Samish Bay Cheese with the co-owner Suzanne Wechsler. And we learned about the many projects of Skagitonians to Preserve Farmland, an activist farming organization that I’m dying to tell you more about (and will–but that’s another story!). Suffice it to say that I immediately joined SPF and have been an avid follower of their activities ever since. 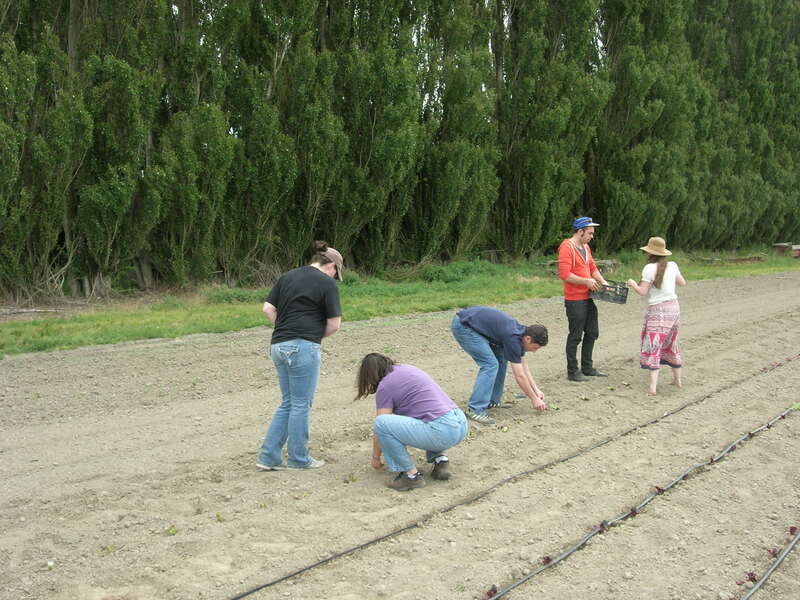 These students know how to work!– Every week, they plowed, pricked, planted, hilled, and dug like old hands. 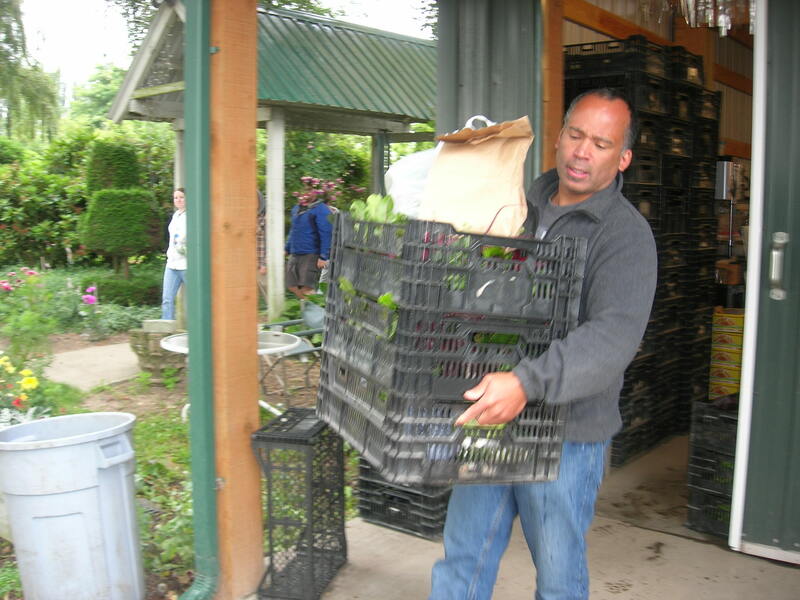 And each week they loaded up their bus with crates of the farm’s produce for the SCA larder, harvested in part from the same fields that they had worked. Which brings us back around to my small-plates lunch at the SCA! These same apprentice farmers were now, crisp in kitchen whites or servers’ black-and-white, staffing an entire buffet restaurant, from host station to prep, line, table, and service. Here’s how it works: you stop at the host station by the front door and buy tickets for 75 cents each (I got 12); the plates range in price from one to say five tickets each. You then wander from buffet table to buffet table trying to compose your meal out of the bounty in front of you; finally, you drop some tickets in a bowl and add another plate to your tray. 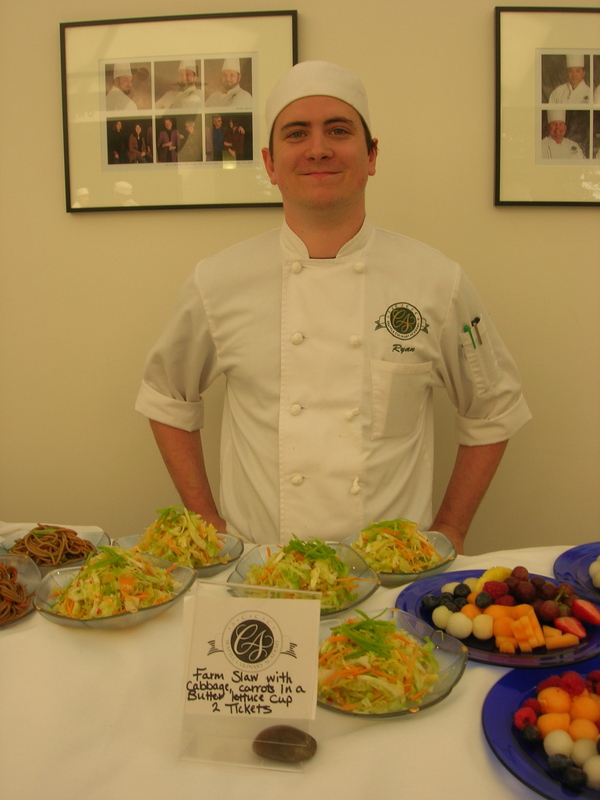 Next I zeroed in on the Skagit Valley farm slaw, presided over by Ryan, who also happily ran through the list of i ngredients (cabbage, carrots, shredded snow peas, Fresno pepper . . .) At that point, I had to sit down and eat! 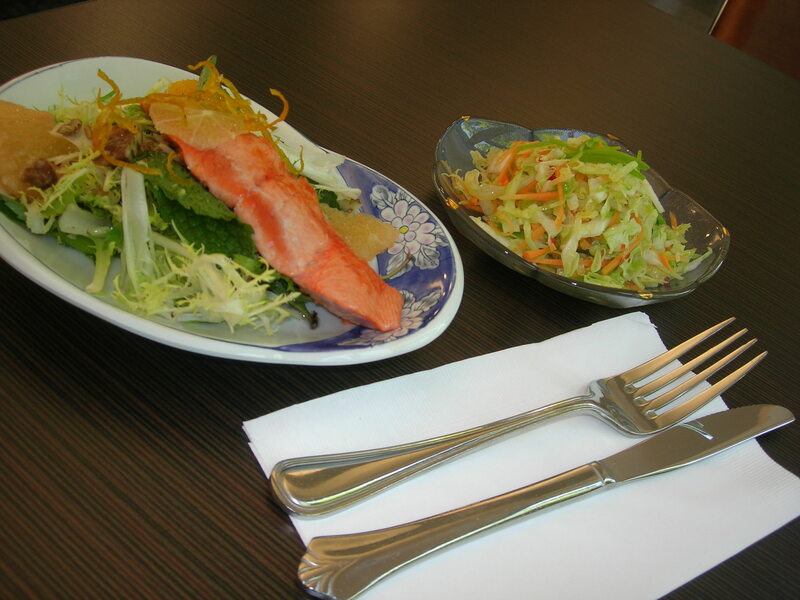 The salmon salad and slaw made a nice combo. 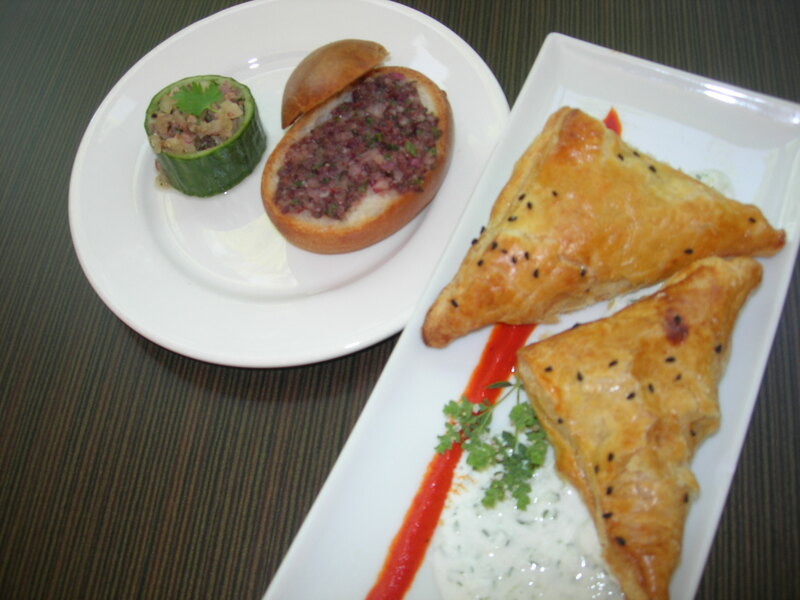 For my next round, after mulling over a number of possibilities I went with the borek (a puff pastry with potato filling, with a red pepper coulis and feta dill dressing) and a Thai cucumber cup with olive tapenade and pan au lait. Did I mention that these guys get high points for presentation? 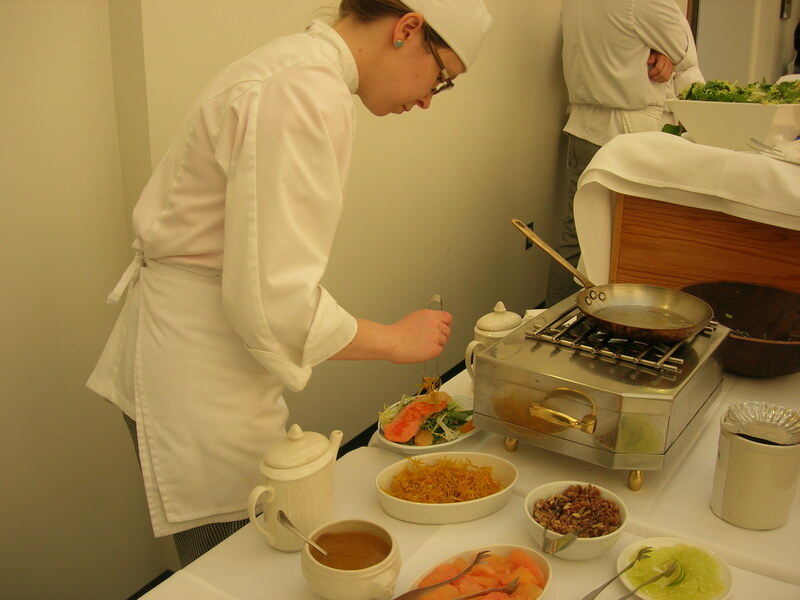 Earlier, chatting with Rachel (that’s her in the first picture of the SCA buffet tables), I learned that she had first studied art; she loves food styling and presentation. I don’t think she’s alone! 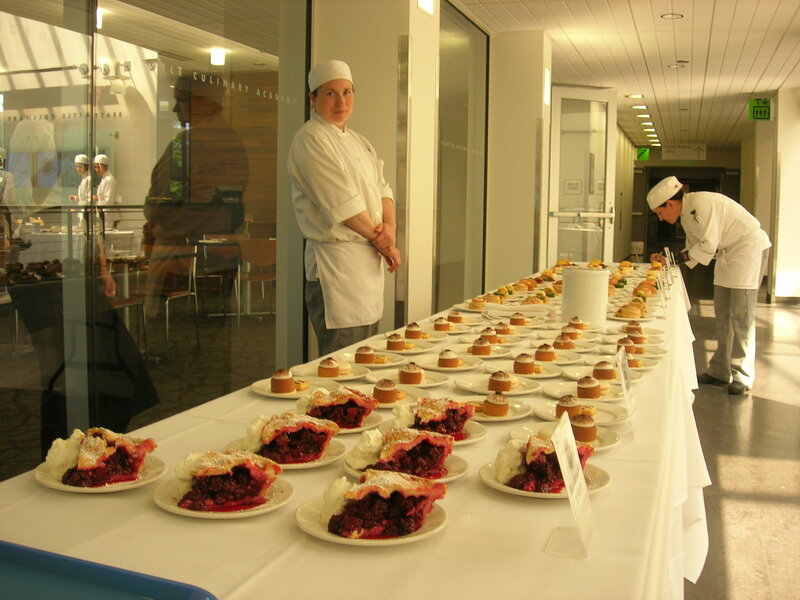 Now it was time to choose a dessert, which is no mean task; SCA has a killer Specialty Desserts and Breads program, and they were really piling it on. 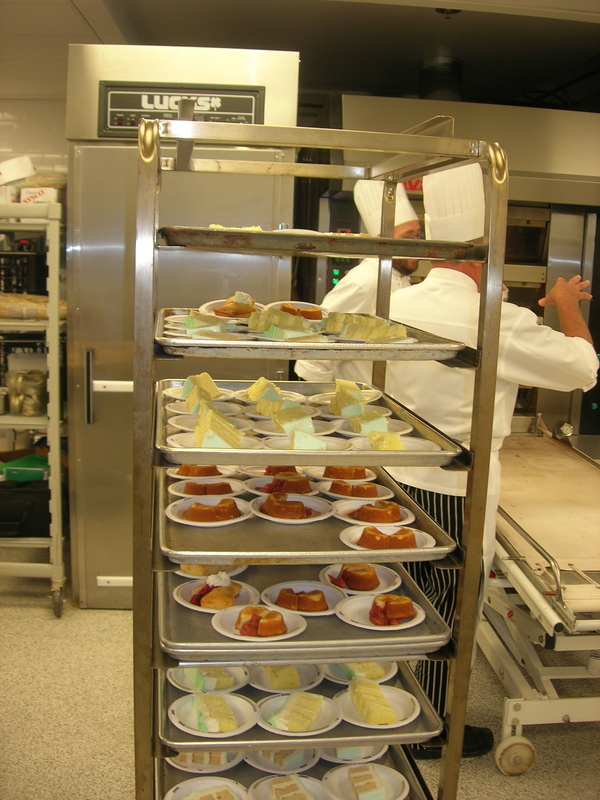 Racks of desserts kept rolling out of the kitchen, and the dessert table looked as long as a football field. A flan? A cake? A pie? Meringue, anybody? But my ticket stash was as nearly empty as I was full, so I settled on a scoop of lemon-basil sorbet. The perfect last bite! 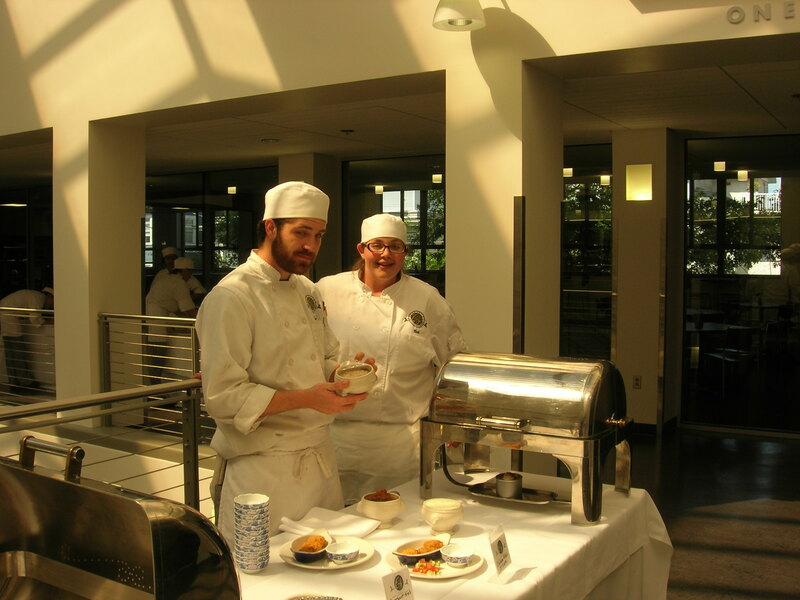 In the dining room, Alice and Richard were serving, and at a slow point I got Alice to tell me a little bit about the program’s curriculum. One of their required courses explores the psychology of human relations; they really think about the roles that food and eating play in our sense of well-being. It struck me that they were doing a good job of translating a small part of that thinking into the concrete actions of unobtrusive, pleasant service. So, for less than $10, I had an excellent meal prepared and served by a whole crew of diligent, delightful professionals-in-the-making. And afterwards, I strolled a couple of blocks over to the new location for Elliott Bay Books and spent a few minutes browsing through the new releases. A great way to turn a lunch hour into a mini-vacation! 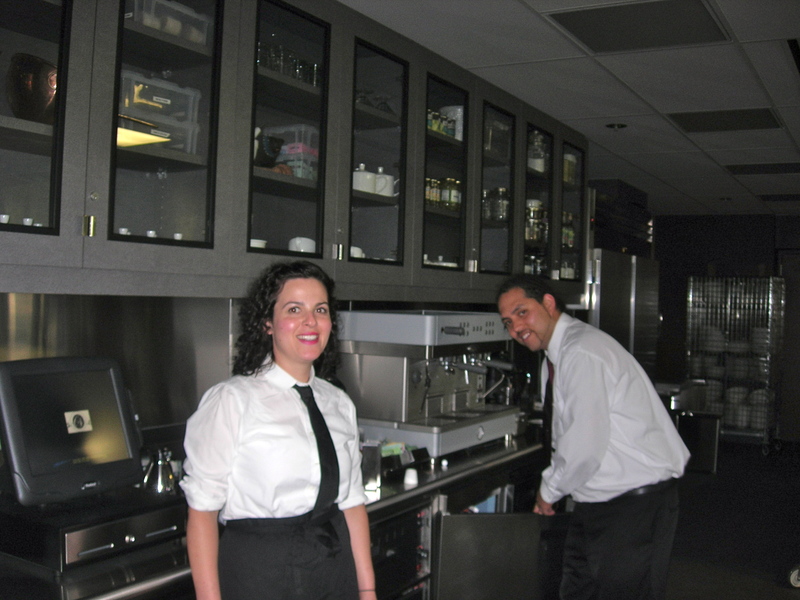 The small-plates program is over for this summer, but the Square One Bistro opens on Wednesday October 5th and the One World dining room opens on Thursday Oct 6th. The Buzz, open now, offers baked goods and pastries (and coffee, natch). (The days and times vary; before you go, check the website for details.) But this is one secret that nobody should keep–you can get a really great lunch at the SCA!